A short overview of the history of arcade games and flash games will show that there is a huge connection between these two types of games. Arcade games have a long history and, even though the arcade games were not in the past what we know them to be today, the same concept is the main ingredient for the new ones as well. The arcade games are usually simple, have iconic characters, a certain number of levels with increasing difficulty and they do not require high skills or much learning time. In addition, they do not have deep storylines as most console games have in our days. Today’s PC or console games with the same qualities can be considered arcade games. Starting from the early 1920’s with the use of old ‘arcade games’ in the amusement parks (such as ball toss games, coin-operated machines or pinball) this whole ‘industry’ has evolved immensely. This passion for arcade games motivated their producers to always search for something better and more entertaining. They have outdone themselves every time something new appeared on the market. From wood made machines and mechanical or electronic scoring readouts to the playing of games online, all games have conquered the hearts of the ageless children. Because people enjoy these arcade games so much they want to play them all the time. This is why they have not even completely left aside the coin-operated arcade games. They resort to them in restaurants, shopping malls, bars or pubs. However, they are only a substitute to the computer versions because playing games online is much better. When speaking of flash games, we must take into consideration the fact that they are a more complex, more modern, even if their ancestors are definitely arcade games. Flash games take their name from the platform used for their building - ‘Flash’, a program made by Macromedia. This modern interactive platform named ‘Flash’ has three major components: the player, the file format and the authoring tool. The main advantage of this program is that of being very easy to use. Because of this fact, the games built with the help of the platform have more options than others do. For example, a house the player destroys will burn down with different effects. In order to be more convinced of the high importance that this platform has for us when playing a flash game we should know that it is usually necessary to download a free version of Macromedia Flash Player each time one feels like playing free games online. Generally, you can download the latest version of ‘Flash’ from Macromedia. That is if your browser gets errors relating to Flash. If you simply like to play good games online without knowing the whole technique that stands behind graphics, too many details about the designing of flash games are unnecessary. Flash games are all the games you play at home on your computer and have the ending ‘.exe’ (meaning ‘executable’). As long as they make you enjoy the spare time spent at home, the flash games will be your best friend. A favorite application can turn into a real sport because playing flash games stimulates competition and trains reflexes. Web sites that host these kinds of activities and offer you free games give you the opportunity of joining teams of players and of participating to mass championships online. Today, flash games have come to incorporate the qualities of arcade games. Flash games have levels, characters and certain plots, just as the old games did, only they are more advanced. Built on the same basic concept that stands behind the old arcade games, flash games now present a bigger potential. Therefore, a wider public uses them. At least one can be found in any home and on any computer. They are short, usually easy to play and they have evolved the same way as arcade games - from shorter to longer, from simple plots to more complex and contemporary ones. When playing flash games you will have to accomplish a certain task. For arcade games, the idea is pretty much the same, meaning that you will have to solve a certain problem. Many of today’s Internet web sites offer a large amount of games, which are very popular thanks to their interesting and exciting plots, but also because of the fact that they are free games. Playing games online offers the player the chance to meet and confront new people or people they already know. 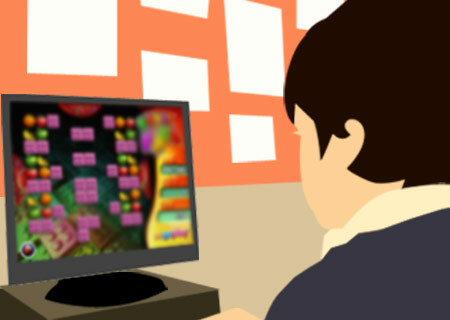 Several surveys have shown that people enjoy sites that have a large offer of free games and that they would rather play flash games than do other things, considered more attractive in general. Another conclusion was that adults are more likely to play flash games than teenagers are. This goes to show that playing has no age and as long as the activity relaxes and makes people have fun it will always create an addiction. There is a child in everyone expecting to have his share of free games online.